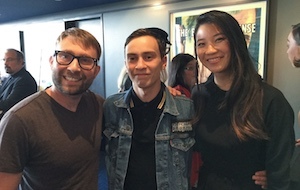 My criticisms of Atypical’s freshman season were certainly no secret, as I shared my feelings both publicly in various news outlets and privately with Robia Rashid, the show’s creator. At the time, I mentioned that a lot of issues could be fixed, but my biggest problem with season one was the lack of autistic involvement. To remedy this problem, I suggested that, at the very least, an autistic consultant needed to be hired for season two. Fortunately my suggestion was taken to heart, and with the addition of autistic consultant David Finch many of the show’s major problems have been addressed. From the moment I began watching season two, I felt freed from the brackish misrepresentations that distracted me in viewing the first season and I was consequently able to enjoy the show. I even laughed out loud during a few of its funniest moments. I am very surprised that the show improved as much as it did and while I intend this review of season two to be very positive, I think I will need to go through some of the problems I had with season one in order to fully convey how big of a leap forward the creators took in the show’s sophomore year. In that vein, I think one major issue with Sam that bothered me in season one was the fact that he often acted in a bizarre ways, so that at best the audience laughed at him and at worst it likely judged others on the spectrum unfairly. For instance, at one point the writers showed Sam’s sensory issue with touching by having him shove a girl off his bed after she touched him. While many of us on the spectrum have sensory issues related to touch, I’ve never reacted violently to an unexpected touch and certainly have never thrown a woman off my bed for this (or for any other reason). At most, I’ve flinched as a visceral reaction, and I know many on the spectrum where the same is true. I bring this up not simply because Sam’s reaction was disproportionate and the show’s manifestation of this autism symptom lacked nuance. My main concern is that it could perpetuate damaging misconceptions regarding autistic people, violence, and inappropriate behavior. Another incident in the first season that I felt was not positive was the depiction of Sam breaking into his therapist’s house to leave her a box of chocolates. In season two, Sam continues talking with his therapist, who surprisingly takes his calls despite his behavior in season one. I think that she seems accepting of this communication out of guilt over the way she handled things in the first season. In general, Sam’s relationships in season two are much more realistic and, more importantly, are extremely positive from a standpoint of portraying autism in an accurate and constructive manner. For instance, instead of furthering the myth that those on the spectrum cannot have a romantic relationship, season two goes a step further and features multiple women vying for Sam’s affection. If anything, Sam treats these women with more respect and maturity than they show towards him which is one very enlightening commentary on how being autistic can actually make one more compassionate, not less. Season two further explores the one thing I liked most about Atypical in season one, its portrayal of family dynamics. I believe that the viewers who loved season one focused on that part of the show and either forgave the autistic representation issues or did not notice them. I think that’s why a lot of parents were excited about the show while autistic people, even those with a roseate view of the series, could readily point out specific issues that they felt should be fixed in the second season. I appreciate that season one resonated with many families who watched and were ecstatic to finally see a family like theirs being represented on television. Thankfully, season two improves even more on that front, as the way that Sam interacts with other characters indicates a positive shift towards his being treated more as a real person and less as simply a diagnosis. Moreover, the way he is talked about is also more positive. I was especially blown away by the power of Casey’s relationship with Sam as a vehicle to help neurotypical viewers to relate to Sam on a deeper level. First of all, Casey’s experience this season of having difficulties fitting at her new school parallels a lot of the struggles that Sam faces in a way to which a wider audience can relate. 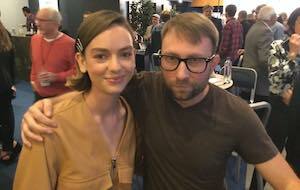 Also, I think that Brigette Lundy-Paine does an impressive job of conveying her connection with, and her understanding of, Sam with impressive nuance, something that stands out to me as remarkable. The choice for her to explore her sexual orientation this season made this aspect of the show much more powerful. In addition, I think Sam seems to be much more relatable to me when Casey is in a scene with him. It seems like Lundy-Paine is one of those exceptional actors who brings out stronger performances from actors playing off of her. 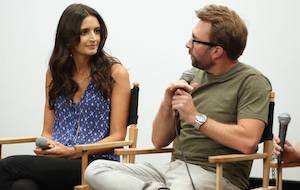 Many reviews of Atypical have focused on the plot lines centered on autism. To me, these elements of the show seem like PSAs, and while I appreciate that Robia and her writers felt the need to include these important topics in an effort to teach the audience about things we face in the autism community, I think the scenes that are designed to deliver exposition information about autism actually end telling us the least about autism. For instance, while I appreciate the intentions behind bringing up the issues of police being untrained when it comes to dealing with autistic people, that storyline seemed a bit forced. In contrast, I felt much more was conveyed about autism with much more depth in the storyline of Casey’s birthday involving a tradition of rituals that Sam adheres to as his way of expressing his love for her. This year, Casey brushes Sam off and expresses frustration due to a belief that Sam is obsessing over these birthday rituals from a place of selfishness when she clearly is trying to deal with other issues. However, the resolution of this conflict, and Casey’s realization regarding Sam’s true intentions, stands out as the most beautiful moment of season two. No review of season two would be complete without mentioning Atypical’s groundbreaking inclusion of actors on the spectrum. Sam’s group therapy is a great vehicle for including a number of autistic actors, but also the diversity of these characters serves to illustrate the fact that “if you’ve met one autistic person, you’ve met one autistic person,” which may be obvious to those of us familiar with autism but is definitely a revelation to the majority of the show’s viewers. I think Atypical shines when it is showing, not telling, and based on the direction in season two I’m excited to see how season three further embraces this strength. In conclusion, the second season of Atypical far exceeded my expectations, and, if it continues going in such a positive direction, by the third season I think it could more than make up for the problematic representations from season one. Robia’s receptiveness to suggestions makes me excited to see how she further includes autistics in season three. In that vein I’ll end this piece with my biggest suggestions for season three. First, I think an openly autistic writer should be added to the writer’s room. David Finch, the show’s consultant, who I believe was instrumental in fomenting the major improvements of this season and penned a hilarious New York Times best-selling memoir, would be a perfect candidate. I personally served as a consultant on FX’s The Bridge, so I know how difficult a job it is to ensure that autism is fairly and accurately represented while concurrently serving the overall story and tone of a show. David did a remarkable job and I think those on the spectrum who’ve been critical of season two fail to acknowledge how difficult a job it was to improve the representation of a character who had already been developed for an entire season. Atypical accomplishes this with a character arc that fixed the issues gradually while not changing him drastically enough to betray the underlying character viewers had come to expect. Finally, I want to see even more autistic characters in season three and I want to see another autistic character with a bigger role. Autism is often thought of only in reference to kids or teens. If Atypical wrote in an adult autistic character, perhaps one Sam could see as a role model, I think that would be a powerful addition to a show that I’m actually really starting to dig. And if you’re looking for an autistic actor to play him, contact my agent. I think I have some availability. Great that you are gradually reshaping their preconceptions. It seems to me that NTs are very rarely capable of developing a nuanced conception of AS, which is a precursor to nuanced depictions on screen. I see the reason for this as basically that they have always seen and learned about AS through the trite stereotypes served up by media and "autism experts" (whose comments are prefaced on research done on young male children, though they apply them to adults). These same experts would never look at research done on NT children and apply it will nilly to all NT adults. The only nuanced depiction of an AS adult I have seen was Benedict Cumberbatch’s Alan Turing in the magnificent film The Imitation Game. It was very subtle and most people seemed unaware of, and therefore they missed the sprinkling of AS complexity throughout the film which stood out like the proverbial sore toe to me (and was true to the extremely thorough biography that depiction was based upon). Maybe you could bring up the film casually and discuss it with the people at Atypical which could perhaps open another door to more nuanced conceptualisations. The show hasn’t screened here so I haven’t seen it, I will look it up though online. I do not have Netflix nor intend to get it but I am glad the show is making rapid progress and I thank you and the other Autistic advocates and the shows writers for making it happen. Many times representation is maddingly frustrating. As autistics, we often get caught up in the flaws and miss the "big picture". The "big picture" is that in the 5 years since I found out I am autistic there has been a lot of progress. Autistic adult lead characters in a Hollywood blockbuster and a popular Network TV show, autistic characters being labeled autistic, media stories depicting autistics accomplishing things. I expected some of those things to take a generation to happen never mind all of them in 5 years. Thank you for helping as you have with Atypical, Alex. My sentiments of season one vs season two are spot on with yours in your article. I’ve said it in another Atypical related thread here, but it bears repeating: I’ve watched Sam’s group session scenes probably 20 times now, just those scenes. That’s how much I liked them. It’s great how each fellow member of Sam’s group session are different. Noelle with her lightening fast "Prove it!" to Sam’s dancing claim and her genuine admission, Lily with her slight verbal challenges, etc. His group is all so different and that’s so great. I’m bummed since he graduated it wouldn’t be believable for him to be in that same great high school group any longer and there’s no reason for his group members to be in the same school he’s planning on going to.